Service by facsimile transmission is a secure form of delivery that some courts recognize as valid service. In order for the service to be considered valid, both parties must agree and a written confirmation of the agreement must be made. Once the facsimile service has been a completed then an original copy must also be provided to the defendant. Where some courts allow it, service by mail refers to the service of notice, legal pleadings, or documents to the parties involved by postal delivery. Service by publication is serving legal documents on a defendant by publishing the service in a newspaper having general circulation in the area in which service has been attempted on the defendant. This method of service is reserved for when the addressee cannot be located at his/her known address and has been approved by the court as an alternate form of service of process. Service of Process is to give legal notice to an individual involved in a legal proceeding. There are federal and state rules and procedures that each process server must follow in order to provide legitimate and legal service. The legal notice is given in the form of delivering legal documents to the individual. A skip trace or trace is performed to identify information/details on an individual or entity for the purpose of legal process or debt collecting, or missing persons etc. Skip-tracing is the act of conducting a “trace” (search) on an individual/entity in an effort to find useful details/information. A skip-tracer may use a variety of tools and resources for locating such information. A standard process is one of four levels of service that Writ Legal offers in regards to service of process. A standard process or commonly referred to as a routine service is a service that is attempted within five to seven day. 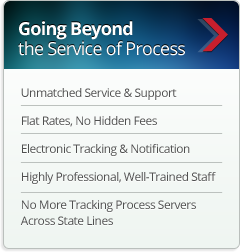 Other levels of service include Express Process, Priority Process, and Urgent Process. Substituted service is a method of serving process upon a defendant in any manner, authorized by statute or rule, other than personal service within the jurisdiction as by mailing a copy to his last known address or by personal service in another state. The summons is a document to put a defendant on notice by the court when a lawsuit is filed and cites the defendant to appear in court to answer the suit. The summons includes the following information: the name of the plaintiff and defendant, the title case or file number, the court and its address, the name and address of the plaintiff's attorney. The summons also includes instructions on how to file a required response to the complaint within a certain time period. Usually, the proof of service is on the back of the summons. This portion should be completed by the process server and is similar to the affidavit of service. Surveillance or a “stake-out” is the monitoring of an individual(s) behavior or activity in an inconspicuous manner. Surveillance can be documented in a video or non-video format but in some cases must be performed by a licensed investigator; however, it is important to note that the act of gathering video surveillance must not infringe on an individual’s privacy or used for commercial purposes without the individuals’ consent.